For the Ancient Greek herm (sculpture), see Herma. 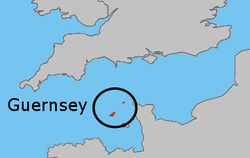 The States of Guernsey, of which Herm is a dependency, issue their own sterling coins and banknotes; see Guernsey pound. Herm is the smallest of the Channel Islands that is open to the public. Herm is only 1½ miles long. Cars are banned from the small island just like its Channel Island neighbour, Sark. Unlike Sark, bicycles are banned too. The sandy white beaches make Herm a walker's paradise. This page was last changed on 6 April 2017, at 10:02.